For decades, ever since dyslexia was described as a disorder in learning to read, scientists, educators, and parents have wondered about the causes. Why is it that one child within a family of normal readers has so much trouble learning to sound out new words, can’t learn to read effortlessly with good comprehension, or needs a great deal of special tutoring to learn what comes easily to other children? Over forty years ago, reading specialists speculated that there might be some defect in the brain that could account for dyslexia. Some experts even used the term “minimal brain damage” or “minimal brain dysfunction” to account for the struggle some children experienced in learning to read. But, after years of research with EEG and anatomic scans like CAT or MRI images, no structural differences could be found to account for reading problems. In the 1980’s, Normal Geshwind and Albert Galaburda of Harvard Medical School proposed a theory to account for neurological changes that would not be visible to the naked eye or on brain scans but could cause dyslexia. They hypothesized that the causes of dyslexia might be microscopic changes in brain physiology due to differences in the development of the brain. Brain cells form before a child is born by dividing from base cells and travelling, or migrating, to form functional parts of the human cerebrum. Geshwind and Galaburda argued that there might be factors which occur while the brain is forming that could cause neuronal cells to migrate incorrectly. Neurons that migrate incorrectly never mature and are called ectopic cells. Under a microscope, ectopias look like small warts on the top of the brain, but they cannot be seen on conventional CAT scans or MRI’s. What are the causes of the ectopias? How are they related to the differences in the magnocellular pathways? How do such small cellular abnormalities cause such severe dyslexia? What can be done to remediate the problems that result? Animal research has recently clarified how ectopias form in the brain. In humans, around four to five months gestation, cells migrate to form the cerebral cortex. As the cells are migrating, they are guided by radial glial cells. These guiding cells act like ropes that the cortical cells can climb to reach their end position. At the end of the climb, a membrane acts like a ceiling so the cells remain where they belong. If there is a breach in the membrane, the cells migrate through the breach. Although researchers originally believed that a mother’s immune system might play a part in the development of ectopias, it is now generally agreed that a genetic component is a factor in the development of ectopias. At this time, at least two or three genes have been identified that result in the formation of ectopias. A second form of minor neocortical malformation, microgyria, has also been linked to processing disturbances in animals. Like ectopias, microgyria, are microscopic malformations that can be induced in animals while the brain is forming. A question still remains, however, as to how minor cortical malformations might lead to dyslexia. Animal research has begun to clarify the relationship. When very small malformations are induced in the brains of rats, for example, researchers have found that these will cause a major restructuring all over the brain. Because the brain is so plastic, small abnormalities in a developing brain can produce profound consequences. One region that this restructuring can affect is the magnocellular cell system in the lateral (vision) and medial (hearing) geniculate nuclei of the thalamus. It appears that when neurons migrate incorrectly and form ectopias, these may lead to abnormalities in the magnocellular system neurons that conduct auditory and visual impulses to the cortex. As many as 80% of children who have defects in the fast, magnocellular, auditory sensory systems go on to be diagnosed as dyslexic. However, the impact of these magnocellular abnormalities has been poorly understood until recently. Researchers from several different perspectives have begun to clarify the relationship between reduced magnocellular function and reading. For over twenty years, researchers in child language have known that children with developmental language problems have problems recognizing and sequencing tones that occur too close together in time. Dr. Paula Tallal, who first recognized this phenomenon in language impaired children, theorized that a problem detecting tones occurring within rapid succession impaired perception of the phonemic contrasts needed to learn language and later learn to read. Recently, this same phenomenon has been observed in male rats with induced cortical malformations. In one study, male rats with induced malformations could not detect two tones if they occurred in rapid succession, less than one quarter of a second apart. In a separate study, male rats, unable to detect a second tone when presented within 72 milliseconds of a first tone, were shown to have a greater number of small and no large cells in their medial geniculate nucleus. Taken together, these studies point to the interrelationship between microscopic developmental malformations in the brain (ectopias and microgyria) and problems with rapid processing (large, magnocellular) systems in the thalamus. Several new studies of reading skill and dyslexia add the final link for understanding the relationship between rapid processing systems and reading skill. One study conducted by Talcott and his colleagues at Oxford University showed that phonological reading decoding skills were correlated with ability to process fast moving auditory stimuli, while the ability to recognize words with irregular (non-phonemic) combinations of letters was correlated with ability to process fast moving visual information. David Heeger and his colleagues at Stanford University have reported findings from a functional imaging study comparing normal and dyslexic readers while performing tasks that require fast visual processing. They found less activity in the magnocellular pathways of people with dyslexia than in the normal readers. In a third study, John Gabrieli, Torkel Klingberg and their associates at Standford University have found, using a new imaging technique called “diffusion tensor imaging”, that adults with dyslexia have less well organized white matter in regions of the cortex responsible for integrating auditory and visual information. They have speculated that these white matter differences represent differences in processing speed. 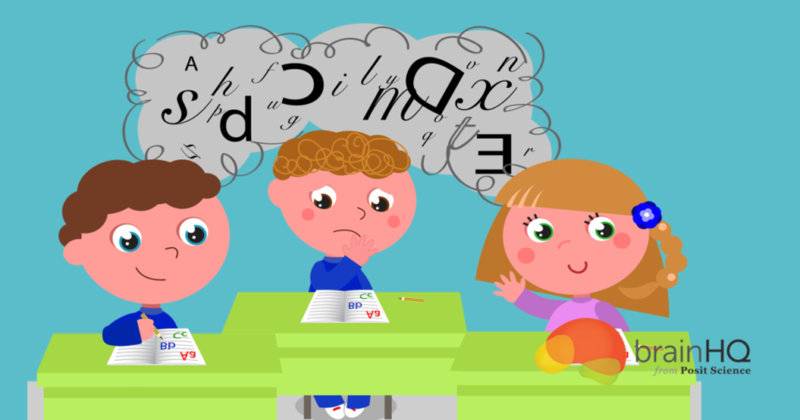 In an intervention study, Habib and his colleagues at the Cognitive Neurology Laboratory in Marseille, France found evidence that modifying speech signals to slow the rapid speech transitions significantly helps children with dyslexia. In a study of twelve ten- to twelve-year old children with phonological dyslexia who underwent intensive phonological awareness exercises (45 minutes a day over a five week period), those for whom the short transitional speech elements were slowed and made louder made significantly greater gains than the children who received normal speech for their training. Taken together, these results suggest that a key to learning to read is the ability to process rapidly occurring sounds and visual signals. It appears, from Talcott’s research, that there is a continuum of skill in this domain, with better readers also showing greater processing speed. Processing speed, in turn, seems to be linked to magnocellular processing pathways that conduct information from the thalamus to the cerebral cortex. Finally, magnocellular systems are affected by early minor alterations in the microscopic development of the cerebral cortex that seem to be guided, at least in part, by genetic influences. Although researchers are beginning to understand the biological foundations of reading and reading disorders, it is important to recognize that there is a great deal that remains unclear. Although there may be a genetic predisposition to factors that contribute to reading disorders, clearly there is not a one-to-one correspondence. Talcott’s finding that reading skill, in general, is related to both visual and auditory processing speed, suggests that reading skill occurs on a continuum and involves at least two processing systems. Animal research further suggests that processing speed is related to cellular systems in the thalamus that process rapidly changing stimuli. However, there may be gender differences in these influences, and the biology appears to be plastic, that is, able to be altered by intensive instruction or other environmental factors. We all await the research that will further clarify these latter considerations, as it will help educators to tailor their methods to the specific needs of each child. Dr. Martha S. Burns is a certified speech-language pathologist on staff at Evanston-Northwestern University Hospital and on faculty at Northwestern University department of communication sciences and disorders. She has published widely on neurological foundations of language and reading disorders. Azar, Beth. 2000 What’s the link between speed and reading in children with dyslexia? Monitor on Pscyhology. March: 36-39. Habib, M.; Expesser, R.; Rey, V.; Giraud, K.;Bruas,P; Gres, C. 1999. Training Dyslexics with Acoustically Modified Speech: Evidence of Improved Phonological Performance. Brain and Cognition. 40:143-146. Murray, Bridget. 2000. From Brain Scan to Lesson Plan. Monitor on Psychology. March: 22-28. Talcott, Joel; Witton, Caroline; McLean, Maggie; Hansen, Peter; Rees, Adrian; and Green, Gary. 2000 Dynamic sensory sensititvity and children’s word decoding skills. Proceedings of the National Academy of Sciences.